Photo: Main and Cesar Chavez via Google’s Street View. The photo postcard of China City, stamped 1941, has been listed on EBay. Notice the sign says that China City is at Main and Macy, which became Cesar Chavez Avenue in 1993. You might be curious because you think of Chinatown a few blocks farther north, where Hill Street (formerly Castelar) comes off the Pasadena Freeway/Arroyo Seco Parkway. (Yes, we do like to rename our streets in Los Angeles.) Notice the traffic semaphore and the overhead cable for the streetcars. 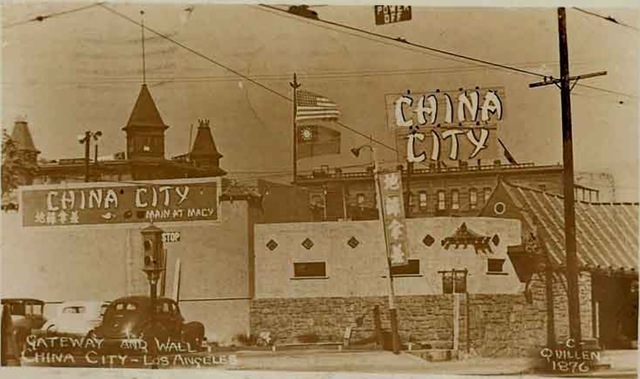 This entry was posted in 1941, Downtown, Found on EBay, Photography and tagged #Chinatown, #EBay, #la. Bookmark the permalink.